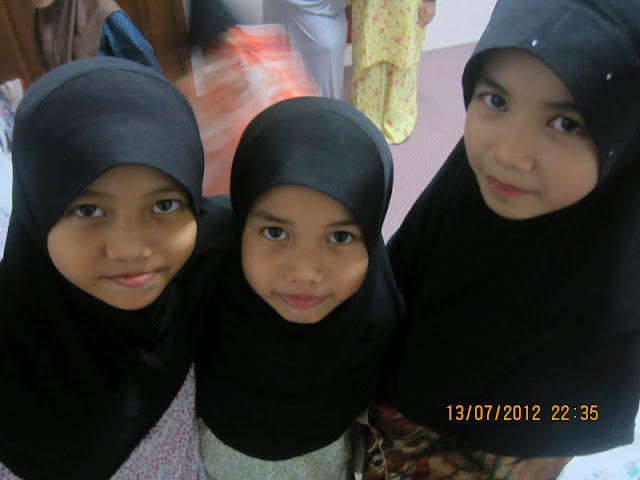 Meet Sakinah, Shahirah, and Barirah. Aged 4 - 7. Still so very young, and have such bright futures ahead of them.. But wait..there's just something not quite right about this picture.. According to UN statistics, there are about 410,000 orphans, presumably only those with no parents in Malaysia, yet the whole population of Malaysia which is about 28million people, aren't even able to give these children in need the necessities they deserve. As Muslims, it is our duty to make sure our Muslim sisters and brothers don't go through what we wouldn't want our family or even ourselves to go through. Prophet Muhammad (S) has said: "No one of you believes until he loves for his brother what he loves for himself." That is why Islam encourages us to give Sadaqah. Sadaqah does not always traslate to money. All good deeds are considered Sadaqa in Islam. So If we cannot contribute in means of money, or food, or other necessities, we can always pay a visit to the orphanage or charity shelters and take the time to play with them, read them a story, show them some love, anything to make them smile. Or maybe even the simplest gifts like bringing them fruits or 'kuih muih'.. apa apa saja yang kita mampu..
Ramadhan is almost ending, so don't let our good deeds come to an end as well. Salaam, Maa Sha Allah, these girls are so pretty. May Allah protect them Insha Allah. I want to ask you to read this, it's not my blog or something. This is not spam. It's about our brothers and siters in Burma. Would you please sign this and share this? Djazaak Allah. BarakAllah for visiting I hope you can share more often your words over at my entry.. :) Thank you for sharing jazakAllah Khair. Eid Mubarak - I hope you had a great Ramadan.